Given her early accomplishments, one might have predicted greatness and, sure enough, Lucille went on to have a major career in the 1930s and ’40s as one of the first concert harpsichordists—primarily in England, where she lived the rest of her life. Nevertheless, she has remained unheralded in Vassar history, as well as in the standard music reference books, where there is nothing more about her than short biographical paragraphs. Born February 22, 1898, the only child of Edward W. and Caroline Craig Wallace, Lucille grew up in comfortable circumstances on Chicago’s North Side. Her principal academic interests at Vassar were history and English, but she also did intercollegiate debating and was president of the German Club. As a senior, she acted as “assistant music director” and accompanist for the 1923 Founder’s Day production of The Beggar’s Opera under the supervision of Professor George Sherman Dickinson. After graduating Phi Beta Kappa, she continued her studies as a Vassar fellow at the University of Vienna, where, in 1923-24, she studied history and music history, and in 1924-25, she continued her studies at the Sorbonne. Lucille with her husband, the noted pianist Clifford Curzon. 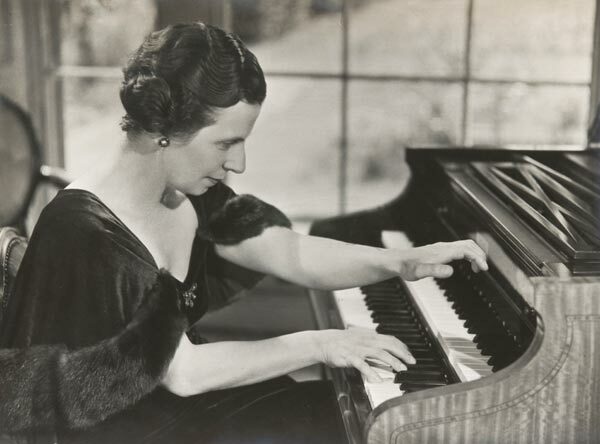 Between 1927-32, after deciding she wanted to become a professional musician, she studied in London, Paris, and Berlin, including private lessons with three of the most revered musicians of the 20th century: the Austrian pianist Artur Schnabel, Polish harpsichordist Wanda Landowska, and French composer, conductor, and teacher Nadia Boulanger. In 1928, while studying with Schnabel in Berlin, she met a fellow student—Clifford Curzon, a young English pianist nine years her junior, who had suspended his burgeoning career (and sub-professorship at the Royal Academy of Music in London) to study with Schnabel. Smitten with Curzon and his playing, she invited him to her villa on the Attersee in the Salzkammergut area of Austria. The villa had been made possible through an inheritance from her recently deceased father, whose fortune had been made from the Red Cross Toothache Remedy. On July 16, 1931, Lucille and Clifford were married in Paris. 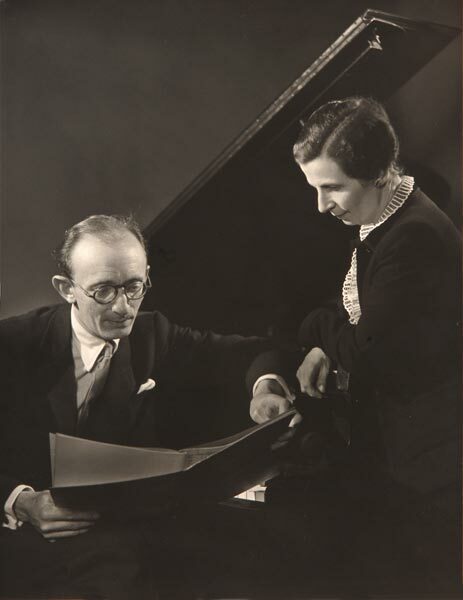 At the time of their marriage, Lucille and Clifford were studying in Paris with Landowska, considered largely responsible for the resurrection of the harpsichord as a viable instrument in the 20th century. The harpsichord had had its heyday in the 17th and 18th centuries, but the rise of public concerts and larger concert halls in the 19th century brought the more powerful modern piano into dominance as the keyboard instrument of choice. Near the end of the 19th century, however, a revival in the study and performance of Baroque music began, and Lucille was an early advocate. A fellow American student of Landowska, Ralph Kirkpatrick (who would become prominent as both a harpsichordist and scholar), called Mrs. Curzon “the most interesting and intelligent of her pupils.” Undoubtedly through Landowska’s influence, as well as her own interest in 17th- and 18th-century music, Lucille pursued a career as one of the pioneering concert harpsichordists, becoming one of the most respected and successful in the field. London now became her permanent home and, from about 1932-50, she performed concerts throughout Britain and the continent. She was a constant presence on the London music scene with numerous solo recitals and appearances in chamber music and concertos at such prominent venues as the famed Wigmore Hall and on BBC Radio—either in live performances or in talks about early music. Reviews of her playing over this period are almost always laudatory. 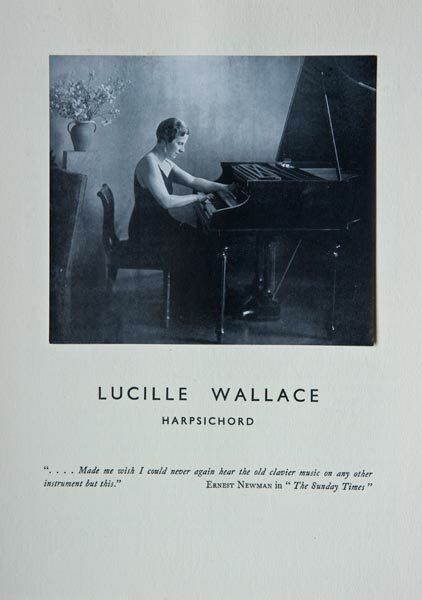 A 1930s-era brochure showing Wallace performing on her own Pleyel harpsichord (the same French instrument that her teacher Wanda Landowska played). “A harpsichordist of unfailing musical instinct and intelligence,” wrote one reviewer. Another complimented her “bold, powerful style of playing.” It was no surprise, then, that she received the singular honor of being asked to perform Bach’s mighty Goldberg Variations on the evening of September 29, 1946, the first day of broadcasting for the BBC’s classical music station (the venerable Third Programme, later to become Radio 3). It is a pity that there are no commercially available recordings of her artistry. In her only performance at Vassar after graduation, she played a recital in Skinner Hall on January 8, 1948, presenting a varied program of works by Bach, Handel, Scarlatti, Haydn, and others. Professor Emeritus of Music Earl W. Groves recalls that she used Vassar’s Neupert harpsichord, a highly regarded instrument in its day. At the Curzons’ London home, adjacent to Hampstead Heath, where the walls bore works of Monet, Corot, Utrillo, Bruegel, and a Mozart manuscript, their son, Fritz, remembers growing up in a generally quiet and constrained family atmosphere, with few parties and with Lucille’s protective insistence that Clifford’s need for quiet reflection and uninterrupted practice time be observed. Fritz recalls “sweating profusely” while waiting for Clifford to finish a phrase before interrupting him to come to a meal. 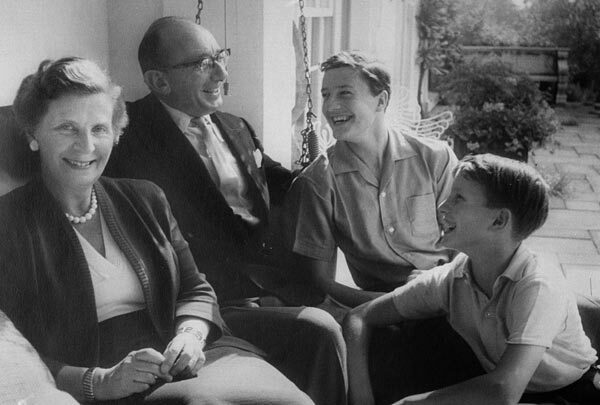 Clifford, Lucille, Peter, and Fritz on the porch of their summer home in 1958. Photo by Gerti Deutsch. Clifford’s performing and recording career continued to flourish into the ’50s, ’60s, and ’70s, and Lucille frequently accompanied him on his annual visits to the United States. During the summer of 1975, however, she suffered a stroke, from which she never completely recovered. Pianist Todd Crow is the George Sherman Dickinson Professor of Music at Vassar. Photos courtesy of Fritz Curzon. The 2013 AAVC Award for Distinguished Achievement recipient—executive producer of PBS’s Masterpiece, Rebecca Eaton ’69—has won 65 Primetime Emmy Awards and has even been named an Officer of the Order of the British Empire by Queen Elizabeth II. But the wildly popular Downton Abbey, a series created by Carnival Films and co-produced with Masterpiece, may be her crowning achievement. For Maryann Kallison Friedman ’55 and her husband, Al, a Vassar College Art Gallery lecture on Hudson River School painters inspired a collection that has enhanced their lives for three decades. Associate Professor of English and Africana Studies Kiese Laymon writes to honor the black Southern writing tradition and teaches to open minds.